Professional triathlete, Jordan Rapp, was on top of the world in 2009, after winning Ironman championships in both Canada and the US. That world collapsed when he collided head-on with a car while biking at 30 mph. His injuries were both potentially life threatening and career ending, but not only did Jordan survive, but he’s also back on the podium again. He gives much of the credit for his return to championship form to SpiderTech Tape. 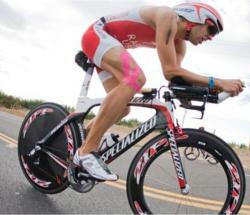 Spider Tech is the world leader in precut kinesiology tape applications for a wide variety of body parts. With step-by-step instructions included with every application, anyone can learn to tape themselves for relief of pain and inflammation or to support fatigued or injured muscles. Because the tape is thin and stretchy, it is an ideal sports tape for injured athletes, allowing them to continue competing with full range of motion as they recover from strains and sprains. Spider Tech Tape is available online at Theratape.com.